FILE - Al-Shabab fighters march with their weapons during military exercises on the outskirts of Mogadishu, Somalia, Feb. 17, 2011. 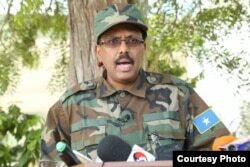 Somalia's new president, Mohamed Abdullahi Mohamed, declared war on al-Shabab Thursday, replacing the country's military leadership and giving the insurgents 60 days to surrender ahead of a fresh offensive. "Bomb attacks have become a common occurrence," Mohamed said. "Because of that, I would like to announce to the Somali people that the country is in a state of war, and the state of the war is not going to be on one front. This war will be a justified one." The announcement to carry out a full-scale war against al-Shabab comes a day after the militants detonated a vehicle full of explosives at the Interior Ministry building, killing seven people and injuring dozens. Al-Shabab no longer controls any major Somali towns or cities, but the group continues to stage bomb and gun attacks against government forces, workers and civilians. Abdullahi Halakhe, a security analyst on the Horn of Africa, says Somalia's government lacks the capacity to carry out a major offensive against al-Shabab. "The only problem is, does [Mohamed] have the capacity to take an all-out war to al-Shabab?" he said. "Does he have the army, does he have the police, does he have special forces to do that?" While campaigning for president, Mohamed vowed to secure the country and build the army. The state depends on some 22,000 African Union troops to defend the government and the population against al-Shabab. FILE - African Union Mission in Somalia (AMISOM) troops ride an armored vehicle past a burning car after it exploded in Somalia's capital, Mogadishu, Dec. 6, 2011. Last week, U.S. President Donald Trump approved a request for additional precision airstrikes in Somalia to help the African Union and Somali ground troops "increase pressure" on al-Shabab and deny the terrorists havens from which to attack U.S. citizens or interests in the region. Some security observers say Somali's president will depend on planned U.S. airstrikes and African Union troops to carry out the offensive. In an effort to defeat the al-Qaida-linked group, Mohamed replaced security officers in the police and intelligence service. He also called on citizens to support the operation. "We would like the Somali people to work with the government soldiers who are ready to stabilize and bring peace to the city so that people can lead a normal life," Mohamed said. The government has called on the youth fighting alongside al-Shabab to surrender within two months in exchange for training, education and employment opportunities.